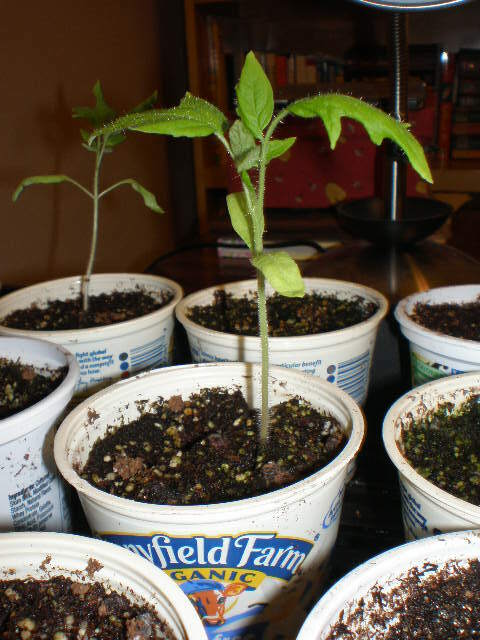 Three weeks ago today I started my first seeds of the season indoors – roma tomatoes, various peppers and brussel sprouts. About a week later they started to sprout. And about a week after that, I started thinning them out. They are the tallest and best ones of the bunch. All three pots that I planted are doing great. 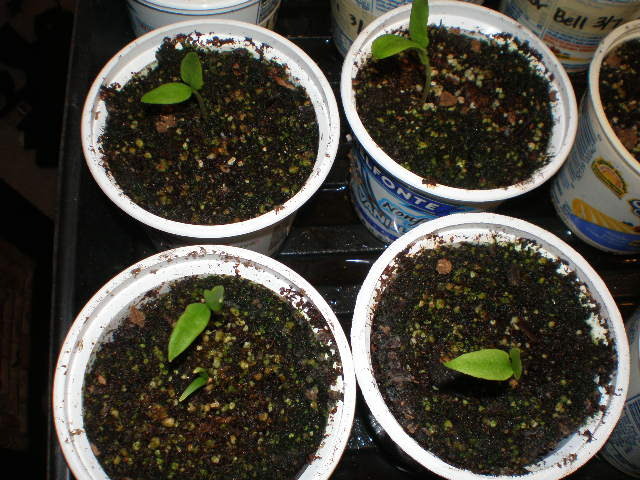 I responded in the comments that your little plants should have at least two sets of true leaves before transplanting. 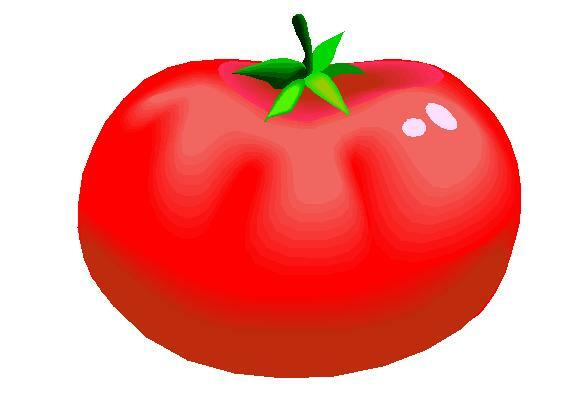 I wanted to post a picture so you know what I’m talking about. The first leaves that sprout are not true leaves. I’m not an expert on plants, but my googling tells me that these leaves are called cotyledons. I vaguely remember that term from school actually. 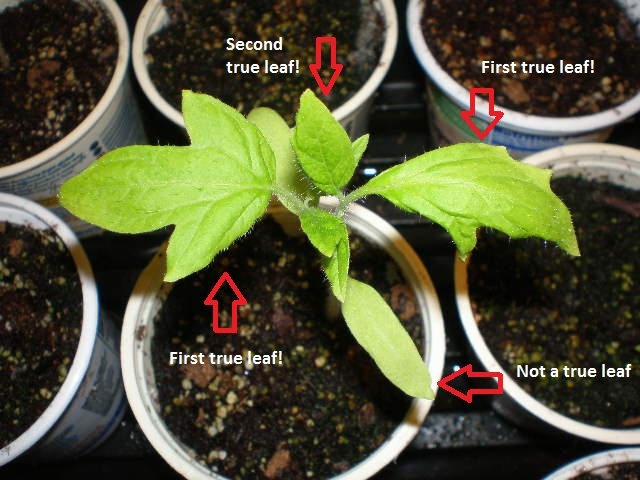 The second leaves to sprout are the first set of true leaves. They will look different than the cotyledons. See in the picture above. The true leaves are larger and are shaped differently. The second set of true leaves will sprout off the first set of true leaves (at least on this tomato they did). They are just starting to get big on my tomatoes. 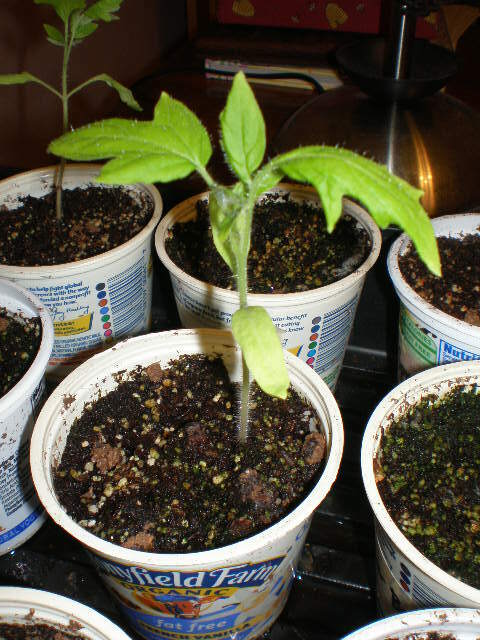 So before you put your plants in the ground, you want them to have at least two sets of true leaves. Now we still have a month until the frost-free date around here so I expect my plants to have many sets of true leaves by then. 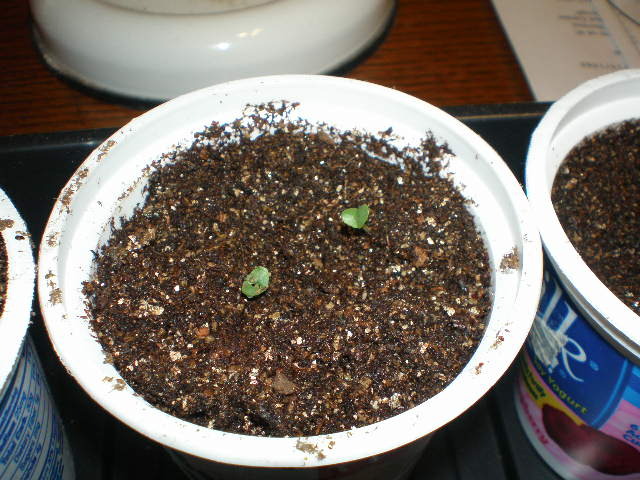 All three pots of green/red bell peppers have sprouted, along with one pot of jalapenos and one pot of colored bell (it’s a variety pack of seeds so I have no idea what color it will be). I know that’s five and there are only four pots in the picture. There is one off to the north that I couldn’t fit in the shot. That leaves two pots of colored bell peppers and one pot of jalapeno refuse to come up. I am excited that at least one of the jalapenos decided to cooperate because last year I could not get them to grow AT ALL. I ended up buying a jalapeno transplant. None of the brussel sprouts have sprouted. I don’t have a lot of hope for them now. 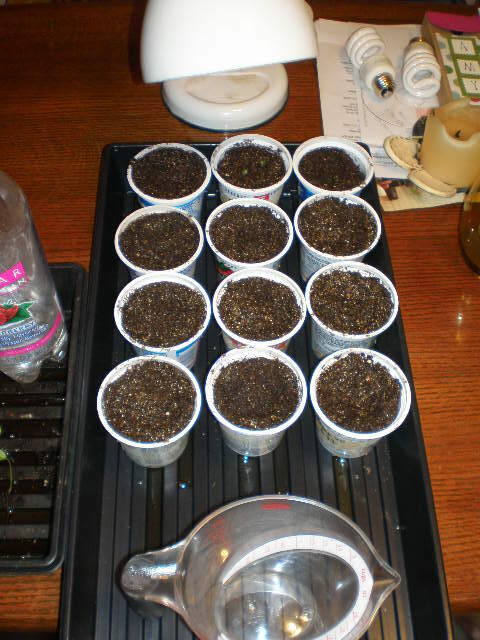 Last Monday evening, Benzo and I started more seeds. Well Benzo did most of the work but I supervised. Look at those little cuties! If I could only grow one thing, it would be basil. Fresh basil is SO expensive at the store and it is SO easy to grow at home. I usually have more than I know what to do with. You can dry it and freeze it and of course use it fresh. But the best thing to do with basil is make lots and lots of green gold. We also planted lettuce, carrots and radishes in the garden last Tuesday night. I was hoping to see some sprouts today, but when I checked the garden this morning they weren’t up yet. Hopefully they pop up their heads this week. We are expecting a ton of sunshine and warm weather all week long. I’m looking forward to the garden drying out (finally) and getting some more seeds in the ground!